Shuffling here and there, but going nowhere. Or just standing and staring at blank cyber-optic screens that once buzzed with their favourite banality. Their hands twitching and contorting on virtual keypads, typing nothing but gibberish. 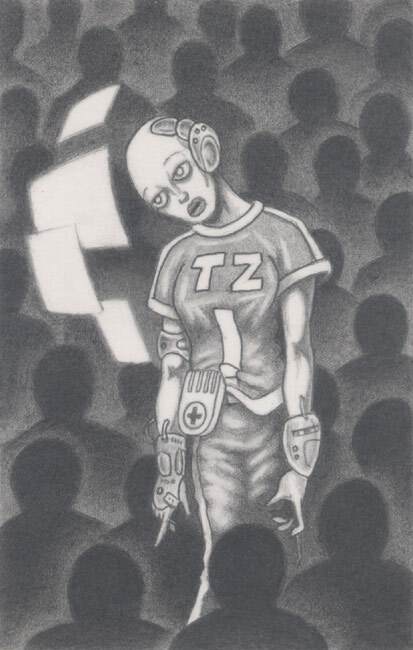 They are the Techzeds (tech-zombies) and they're on their way. First there's a few, then hundreds, then thousands. Victims of an imbalance which devours their minds. The result of high technology dumbed-down too far for the masses to comprehend any of it, or any of the dangers it will bring. The techzed will become utterly withdrawn from friends, family, and the world around them. All higher brain functions gone as they exist on automatic. The world itself nothing more than an ethereal plane of faceless shadows and lost memories. They will be dead, but the devices which they simply couldn't live without will, ironically, be the only things keeping them alive. Some might say it would be a blessing to switch them off and so end what's left of their miserable lives, but many will be left in their mindless electronic purgatory. A disturbing warning to all who see them. "Look at them. Isn't it awful? I'll never be like that."